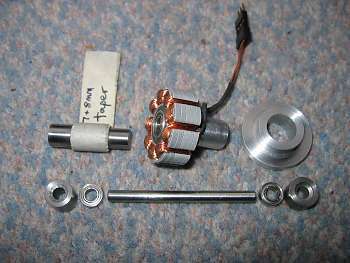 An 'outrunner' brushless motor typically has a stator salvaged from another motor or bought from a specialist supplier. It is wound with enameled copper wire. It is mounted on some form of bearing/stator holder, usually made from aluminium. This hub has a bearing in each end and a mounting flange of some sort. The rotor is the spinning part and comprises a steel ring inside which magnets are mounted. 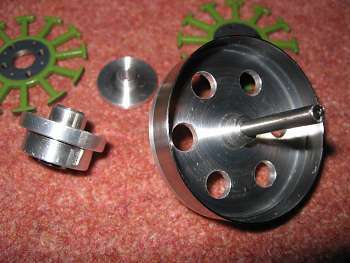 The ring is usually glued to an aluminium end plate through which a steel shaft is mounted. 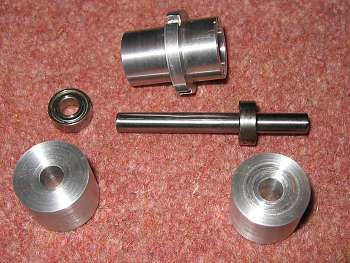 The shaft obviously spins in the bearings and an aluminium prop adaptor is often mounted to one end. For clarity I will refer to stators having teeth and magnets having poles. Our brushless controllers always have 3 wires going to the motor so we almost always wind our motors with 3 wires. This means the stator always has multiples of 3 teeth. Magnets always have North and South poles. Therefore there always has to be an even number of magnet poles (eg: NSNS = 4 poles). 2 or more magnets can be placed together with the same orientation and this is still regarded as one pole per 'pair' (eg: NNSSNNSS = 4 poles). Clearly you need to be able to turn components yourself to make these motors. If you want them to run well then this needs to be to be to a high degree of accuracy. The technique I describe yields a TIR (Total Indicated Runout) of less than 1/100mm on a cheap (but now quite well setup) lathe (BV20). TIR on a couple of commercial motors I have measured is around 1 thou (2.5/100mm) so you can do better than them. To achieve this, your lathe needs to be mounted correctly, have little vibration, the slides must be smooth and slop-free, your tools mounted solidly and sharpened properly, etc. I as an amateur with no training found this to be steep learning curve and have been lucky to have friends who could teach me this stuff. Thanks Steve! It takes quite a long time to drill/bore out solid steel. So the easiest way to make the ring is to use hollow metal tubing. In theory you want the 'right kind' of iron but in reality most of us don't know what this is and certainly cannot be picky if we also want it to be hollow, the right diameter and cheap! I visit scrap yards and buy short lengths of anything interesting. I also use solid metal when I can't find the right size tube. I have no idea what kind of metal it is but they all seem to work! If you can be picky then you want low carbon steel with minimal alloying. In the USA AISI/SAE '1215' steel (<0.9% Carbon), then 12L14 (0.15%) are said to be very machineable and have excellent magnetization curves. 1117 steel (<0.2%) or 11L17 is apparently less machineable but said to be adequate. Most 400 series stainless steels are said to be appropriate as well as 15-5PH and 17-4PH. In the UK 'EN1A' (should be 0.7% Carbon but can be up to 0.15%) (AKA 'BS 970 230M07' or 'Bright Mild Steel') are very common, machine extremely well and seem to perform well in my motors (it has green ends if you spot some at a scrap yard). The ID of the ring needs to accommodate your magnet thickness, stator diameter and air gap between them. Magnets produce flux which flows from one pole (N) to the other (S). Flux does not like traveling through air so you can improve motor efficiency by minimising the air gap to the stator. 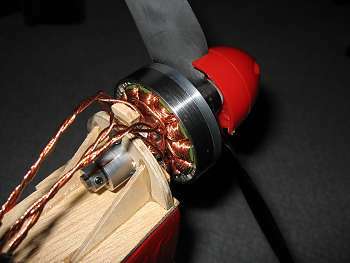 On short motors (stators up to 15mm thick) I usually aim for 0.2mm between the stator and magnets. Magnets usually have flat sides so they do not follow the curved ring (although clearly the corners touch the ring). This makes it a little tricky to calculate the ID of the ring. The formula is in the spreadsheet below. Having decided on the target ID, if you follow the technique I describe, you want to make the ID of the ring about 0.2mm undersize at this stage to allow for truing up later. Magnetic flux likes travelling through iron which is one of the main purposes of the ring. It helps the flux flow efficiently from one pole to the next. To handle this effectively it needs to be thick enough. This is usually about 50-60% of the magnet thickness (eg: 1.2mm for 2mm magnets). 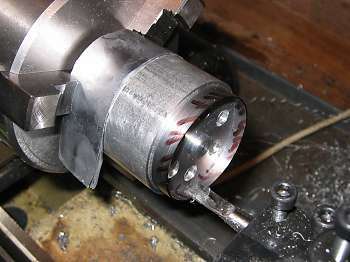 To be more precise, stop the lathe while machining and place a magnet inside the ring. Use a pin to test whether it sticks to the outside. If it does not then that indicates that the ring is 'too' effective (ie: it is still too thick). A ring that keeps all flux inside is perfect but probably heavier than it needs to be. Excessive weight can impact mechanical stability. A more precise way of measuring whether any 'magnetism' is 'escaping' through the ring is to make an electronic measuring tool with a hall effect sensor from a CD-Rom or Floppy disk drive. Here are two descriptions (1 and 2). At this time I suggest you make the OD 0.2mm oversize to allow for truing up later. Rotor heated to expand. Note three pilot holes to secure to end plate. I used to attach the ring to the end plate with epoxy. There needs to be sufficient overlap to ensure mechanical strength. Remember that there is a fairly large mass spinning at quite a high velocity. For instance, my 50.7mm OD ring is moving at 95km/hr when turning at 10,000 RPM. My overlap is usually 5mm on motors for 10mm thick stators and I have used 7mm on my 36mm croc. I also leave 1mm on the other side of the magnets to help prevent the flux from 'spilling' over the edge (and to give contingency for errors!). For instance, for 10mm long magnets and 5mm overlap, my ring would be 10+5+1=16mm wide. I use the lead screw to advance the carriage while turning. This is to get as parallel a cut as possible. Deburr the outer edges before parting off (eg: I hold a fine file against the spinning outer corner with 'Scotchbrite' to clean it up further). Deburr the parted off end as well (again using a file on the outer edge before completing the parting cut, and a deburring tool for the inside corners once parted off). Don't drop the ring on the floor; it may distort and wreck an hour or more's work! My new approach to attaching the rotor to the end plate has been to use an interferance fit and no glue. On a 46mm croc rotor I made the rotor 0.04mm smaller than the flange on the end plate (a slight tapered 'plug' is useful to measure inside holes accurately). When heated thoroughly, it 'drops' onto the end plate very easily and seems to hold well even on a 36mm long rotor. On a motor of this length, I also drilled and tapped three 3mm threads (through the rotor steel and into the ali end plate) and used permanent Locktite to secure three studs. These gurantee that the rotor will never come off the end plate. For precise machining you need to minimise overhang in the lathe chuck. However, I usually start with a length of round aluminium bar which will allow me to make 2 end plates (to reduce wastage - see photo above). The jaws on my chuck need about 20mm to use their full depth so that plus say another 2x20mm (=60mm total length) is where I start. I face this off and make a step/flange over which to fit the rotor ring. Try both ends of the ring when you get close to size as you may find one side is larger than the other. I try to achieve a snug fit which allows me to press the ring on by hand and get it off without tools. Deburr the outer corners of the flange as necessary. You will usually need to hollow out the inside of the end plate to provide clearance for the end windings. This is usually about 4mm on a 10mm stator motor but clearly depends on your stator/winding choices. I usually make the above flange roughly the same thickness as the magnets. 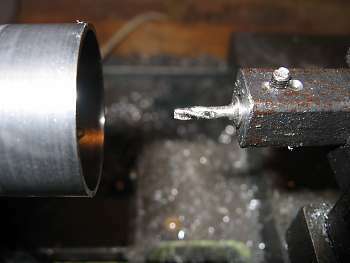 I also drill a pilot hole for the shaft at this time (eg: 4.5mm for a 5mm shaft). You probably want to leave a protrusion in the middle to help hold the shaft later (see photos). This also establishes the clearance between the stator and end plate. Do not remove the ali from the chuck when complete. This step is likely to take another hour or so. Remove any cutting fluids from the ring and ali flange. Put a thin smear of epoxy on both the flange and inside of the ring. Press it on and make sure it seats as fully as possible. Use a dial guage to be sure it is reasonably centered. Allow to cure. Don't worry about the excess epoxy which is squeezed out; in fact you need this to test hardness later. As pointed out above, the mechanical bonding of the ring to the flange is very important due to its mass and speed. So you need to find an epoxy which cures very hard. In the UK I use '5 Star' epoxy (they usually attend the major shows). I have their 15min epoxy which seems to thicken quicker than I would like sometimes. It's pretty hard after 24hrs but I now leave it for 2 days and achieve more accurate results. Make sure you cannot make an imprint in the epoxy with a finger nail. 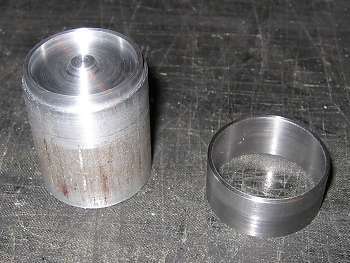 Leave the slug of machined ali and ring to cure while still held in the lathe chuck to maintain accuracy and centering. Place a 100W light bulb next to it in cold weather (if the room does not have heating). The ring was deliberately made slightly over/under-size (OD/ID). Now is the time to true it up if you are sure the epoxy is nice and hard. This step is necessary because the epoxy may allow the ring to be slightly off centre relative to the end plate. Also, you may have to remove the work before completion (eg: to plug an oversize hole) and the extra material will help you still achieve a good result. A few fine cuts should yield a very round bell. Note that the inside dimension is fairly important; you would not want it to be too small. Make sure you skim the ring all the way round so that the remaining steel is a consistent thickness and is perfectly centered. One way of achieving this is to mark the inside and outside with a permanent marker or paint and ensure you cut it all off. Check the runout with a dial gauge on both inside and outside surfaces of the ring. You are seeking less than 0.01mm runout, preferably half that. So, I may have convinced you to bore a blind hole with a miniscule tool! Being small the boring bar is not likely to be very rigid so you typically have to take many cuts because it removes a little more with each pass without changing the setting. So be VERY careful to not make the hole too big. You probably need a grub screw to secure the shaft to the end plate. However, there is a risk that it may push the shaft off centre (remember that the end plate is aluminium which is quite soft). So you need to bore an interference fit which uses friction to centre the shaft. You are seeking an "H7" fit which with 3-6mm shafts means a hole about 0.012mm smaller than the shaft. So for example, if my micrometer indicates that my shaft is 3.995mm, I make my hole 3.980-3.985mm. The precision indicated may sound difficult but in reality it is fairly easy if you do not rush the job. To measure a hole to this accuracy all you need to do is spin a length of spare shaft in your drill press and use some wet and dry paper to create a slight taper on one end. 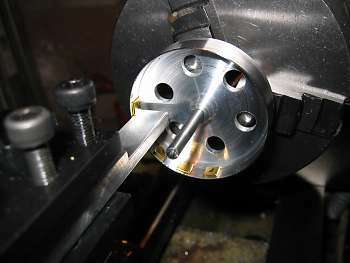 Once the tapered end is smaller that the desired size, remove it, colour that end with a permanent marker, and push it into the hole while the lathe is stopped. 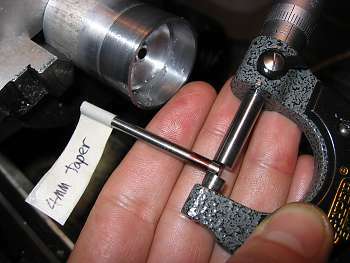 This will remove some of the ink and you then measure the taper at that point with your mic to determine the hole size. Easy-peasy! Go do some experimenting. This step will probably also take an hour or so. Note that if you make the hole too large you will either need to scrap the work, use a larger diameter shaft or plug the hole with a tapered plug pressed in from the inside (ie: from the same side as you will press the shaft in). You will probably have to remove everything to make the plug so mark the position relative to the jaws to aid putting it back as accurately as possible later. Once all the machining has been done, part the bell off. Make sure that the end plate is sufficiently thick to support the spinning mass. I make mine 3mm thick for magnets 3x5x10mm. You should also make sure that the hole for the shaft will be 8-10mm long for the size of motor I have used in my examples. Leave a protrusion on the outer face of the end plate if necessary to achieve this. Straight shafts are like proverbial Hens Teeth! A centreless ground shaft would do the trick but you need to find one. Steel pins from engineering shops may meet this requirement but those I have acquired have been over-size and don't fit the bearings. Drill blanks are an option but mine have never been straight enough. Even tool steel is not straight. Silver Steel ends up being my usual choice and I accept the slight curve it usually has. Bevel the ends nicely so that it presses easily onto the rotor. I do not harded the shaft. Check that it fits your bearings nice and snugly; hold some fine wet&dry against the shaft while spinning it if you need to make it smaller. Bearings are made in various qualities and given a choice you want good ones to reduce noise, the risk of resonance and to improve efficiency. Good ones are often referred to as 'precision' bearings. More formally they should meet 'ABEC5' or 'ISO P5' standards. They are probably 50% more expensive than 'standard' bearings but this extra cost is not usually significant. You don't want to use bearings that are sold with no indication of their accuracy; these may not meet even the lowest quality ratings. Bearings have slop. This is because they are designed for an interference fit, again 'H7'. Surprising as it may seem, bearings shrink when pressed into a hole and if the size is right, they tighten up nicely. So again you need to bore a very precise hole. A 6-10mm OD bearing needs a hole which is 0.015mm undersize and a 10-18mm bearing 0.018mm according to the tables. Again you need a tool for measuring the ID of the hole. 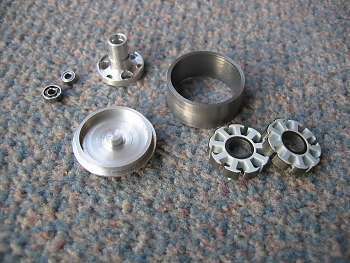 I turn steel to the same size of the bearing OD and again use wet and dry to form a slight taper for measuring the hole. You must not put pressure on the inside race when pressing a bearing into the hole. This will damage the bearing. So I also turn some spacers with a hollow in the middle to clear the inner race. I also drill a hole through the middle the same diameter as the shaft (loose fit). You can then thread all the components together (spacer/bearing/hub/bearing/spacer) with the shaft through the middle to align it all. Magnets are made of iron and are quite heavy. This mass on the outer circumference of a motor will result in severe vibration if not spaced evenly. 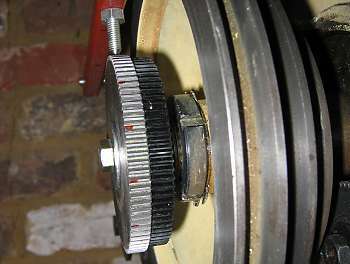 I have mounted a couple of gears on the back of my lathe's spindle. This acts as an effective and cheap dividing head. 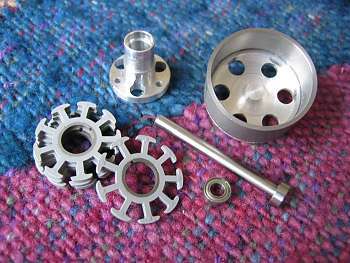 I have used an 84 tooth 'thread cutting gear' that came with my lathe and an 80 tooth plastic one for a '60' sized helicopter. This gives me most combinations that I need. The poles of the magnets usually alternate, NSNS... etc. Which pole is which is not important but what is important is that they alternate evenly. To achieve this, simply take your stack of magnets for this motor. Opposite poles attract so the same pole will always be 'on top'. Mark the top surface of the top magnet with a permanent marker. Now take the bottom magnet from the stack, put it on top of the one just marked, and mark it in the same way. Continue until the 'top' side is marked on all of them. The same pole of all magnets will now be marked, making it a simple task to alternate how you attach them to the inside of the ring (ie: alternate 'seeing' the mark and not). I have made a magnet steady made from from aluminium so that the magnets do not stick to it. Hold the rotor in the chuck, gently so as not to mark it too much. Mount the steady in the lathe's toolpost at half the magnet's width below centre. 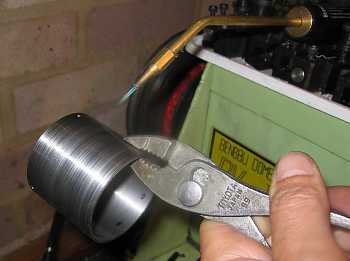 Wind the steady in until it is within about 0.5mm of the inside of the ring. Place a magnet on the ring and slide it down on to the steady. I then use a large pin to apply a drop of thin cyno to secure the magnet (although being magnetic the pin is a bit difficult to use it does seem to apply just the right amount of cyano). Rotate the bell to the next position and continue until all magnets have been mounted. Job done. You need a fillet in the gaps between magnets. I insert small pieces of balsa between each magnet and then saturate them with thin cyano. The main advantages of using cyano to glue the magnets are that it is quick setting and removeable after soaking overnight in acetone. Click on the links above for more info. Click on the links below for other pages.